RICHMOND HILL, ONTARIO--(Marketwire - Feb. 4, 2012) - Ontario's largest union, the 230,000-member Canadian Union of Public Employees (CUPE) is urging all Ontarians to support the passage of Bill 13 - the Accepting Schools Act and to stand behind students in their quest to eradicate bullying with student-run organizations like Gay-Straight Alliances. "Bill 13 is an important step forward towards the elimination of bullying in schools across Ontario," said CUPE Ontario President Fred Hahn. "CUPE Ontario supports this legislation and will do everything in our power to see that it passes." At the last day of their annual conference, a "Day Against Bullying," more than 350 delegates of CUPE Ontario's School Board Coordinating Committee were joined by Hahn, Ontario Minister of Education Laurel Broten and Ontario Student Trustees' Association (OSTA) President Jenny Williams. Minister Broten stressed the importance of all parts of the school community coming together to combat bullying. "We all have a responsibility to make our schools safe and inclusive places," said Broten. "I am proud to work with partners like CUPE and OSTA to say that bullying and intolerance are not acceptable in our schools." Bill 13, if passed, would mandate that school boards across Ontario must support students who want to form organizations that promote equality and advocate for a learning environment free of discriminatory bullying, including organizations like a Gay-Straight Alliance. 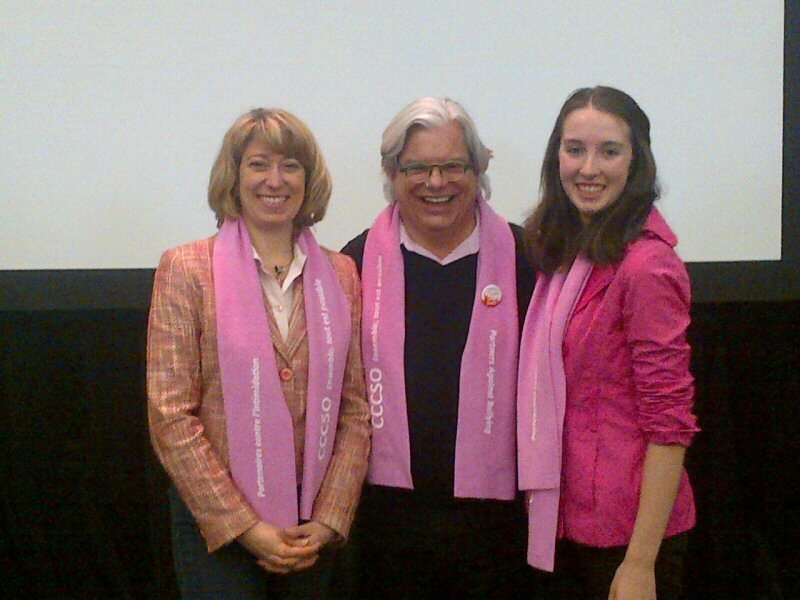 To show their support, CUPE conference delegates proudly clad themselves in pink scarves. "Every day, thousands of children across Ontario avoid school because they fear bullying. CUPE members are not only supporting this legislation," Hahn told Williams, whose organization represents over 2.4 million students, "but are here today to tell students who are being bullied that we have their backs. School secretaries, custodians, educational assistants and other support staff are an important part of ensuring a safe school environment and our members are anxious to stand up and do their part." The OSTA, in their first Ontario student survey, revealed the alarming statistic that almost 46 per cent of students in Ontario schools have suffered at the hands of bullying. "We want to ensure that all issues surrounding bullying are addressed," said Williams. "We look forward to working with political parties and education stakeholders like CUPE Ontario to move forward this legislation to protect students in the future." CUPE Ontario President Fred Hahn with Ontario Education Minister Laurel Broten and Ontario Student Trustees' Association President Jenny Williams spoke to delegates on coming together to support anti-bullying legislation.